This is a short little movie at less than 5 minutes. It was filmed in one weekend with an 8mm camcorder. Most of the editing was done in the camera, however I chose to experiment with some tighter action shots which had to be edited in during post production. Shown above is me in the middle of a jumping spinning hook kick of sorts. 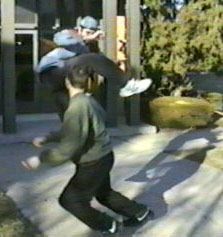 To the right is a still of me doing a leg sweep while Chris Arden falls to the ground. That yellow thing is my Calculus book. Notice how one pant leg is rolled up. Kids, don't try this at home. 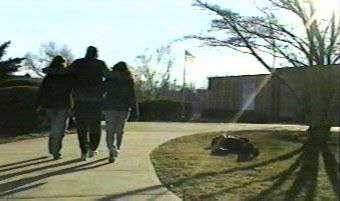 This is a still from the final scene where, Geekboy retreats with the two girls under his arms while the bad guy is seen squirming on the ground to the right. This scene was filmed by the talented Mr. Tripod (others filmed by Michelle and Adam).